We want ordering this to be as simple as possible for you, just order the right amount of pages for your PDF pattern, one PDF pattern print per order please. Don't waste time and get frustrated by sticking A4 sheets together, just use our great service. Sewing Patterns, Dress Patterns, Bag Patterns, PDF Patterns, Trouser Patterns, Coat Patterns, Quilt Patterns, Clothing Patterns, you name it we print it ! When Charlotte is not working at Dotty Print she is busy on her sewing machine so she knows about sewing so don't hesitate to contact her, you might even swap some great ideas! We have lots of experience in printing sewing patterns including making sure your pattern is printed to scale! 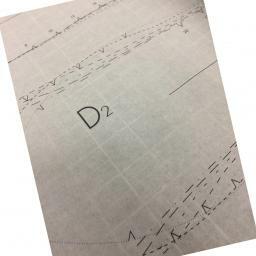 Some patterns require you to have your pattern printed by a percentage, again don't worry we'll pick this up at the printing stage and ensure its printed right first time. Standard size sewing pattern prints are usually based on an A0 (1189x841mm) although we can print larger if necessary please contact us by email or phone and we'll provide a price. Please note our printers have a none printable areas of 5mm around the edge of the print and therefore we do not accept any responsibility if your pattern is outside of this area. The widest we print is 1370mm wide x any length. PLEASE NOTE : IF YOUR PATTERN IS WIDER THAN 841mm OR LONGER THAN 1189mm THIS MAY DELAY YOUR ORDER BUT WE WILL CONTACT YOU IF THERE IS A PROBLEM. 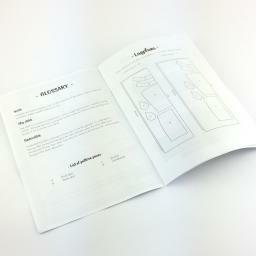 We print your PDF Sewing pattern as it appears - all for the same cost! If you require a large quantity of pattern prints for a sewing class or to sell to your stockists we print hundreds of patterns for designers / shops, click HERE for more details. So pleased I found Dotty Print. Brilliant service and excellent quality printing for PDF patterns. Thank you. Excellent price, delivery and paper quality (40 gsm). I would definitely use this service again for my patterns and would highly recommend them. Thanks Dotty Print. Very fast service. Ordered after 5pm and it was dispatched the next day. Great quality print. Fabulous. Look no further for printing patterns. You have the choice of keeping the price really low (I haven't found anyone near the basic price) or paying a bit extra and getting a faster service on better quality paper. The 45gsm paper is perfectly adequate anyway so why would you? Excellent service, my patterns were delivered next day with no issues. 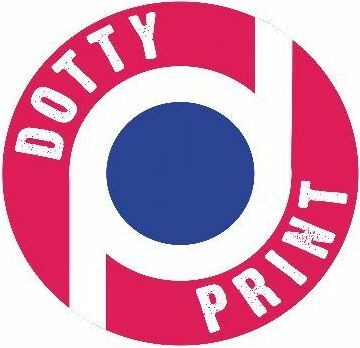 Thank you Dotty Print . I will be recommending you in the future. Excellent service. Received on quality paper with other papers available. This is the most cost effective way to get your patterns. Orders received before 11am will be processed within 2 working days and dispatched with a second class stamp. Orders received before 11am will be processed within 2 working days and dispatched 1st class. Orders received before 11am will be processed the same day (subject to any issues) and dispatched 1st class. We process your pattern(s) as above depending on which service you select to anywhere in the UK (restrictions apply to the following locations:- IV, HS, KA27-28, KW, PA20-49, PA60-78, PH17-26, PH30-44, PH49-50, ZE. We have now added an option for you to upgrade to 1st class post and to bump you up the queue.